The main hall can accommodate up to 120 guests in banquet style with enough space for a big dance floor. We’ve merged styles to cater for all discerning eyes with exposed roof trusses, crystal chandeliers and crisp clean floors with neutral colors on the walls. We offer rectangular wooden tables custom made for the venue with necessary chairs and white covers as standard. 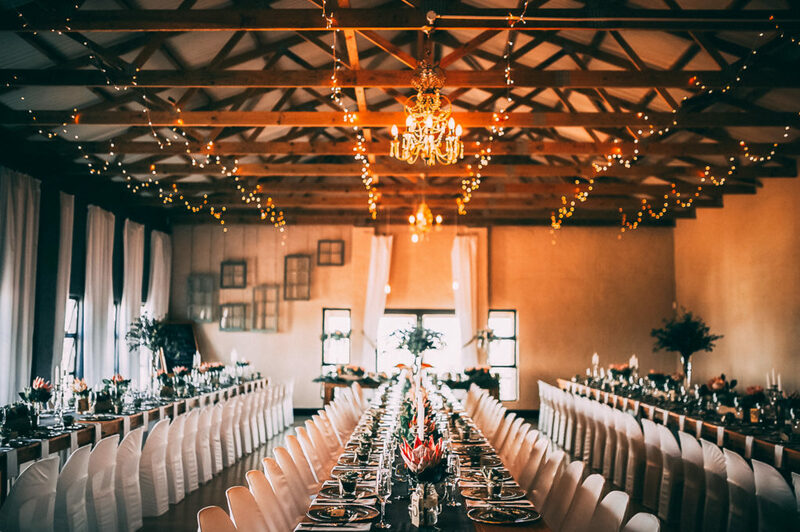 Included in our standard venue rental comes to all necessary cutlery, crockery, glassware, silver under plates and napkins., Our basic decor also includes our silver candelabras. Over the years our decor collection has grown, and we can play around during your site visit to set up a mock table to your liking.